Some time ago I was involved in a calendar swap on the Craft Mad forum. 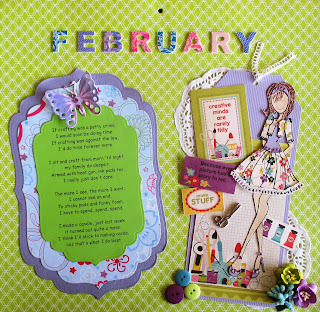 We all swapped a calendar with our partner and I was fortunate to be partnered with the lovely Mandy who sent me a calendar with a lovely verse on a decorated panel for each month of the year. I am in love with the Julie Nutting doll stamps so I decided to make a new calendar and incorporate the verses and the stamps. This is my February page. Today I would like to show you jewellery box I made for a family members birthday. It is a Twiddleybits box which I have covered in Prima paper and added flowers flourished and butterflies. I added a pearl trim to the outside and a music box on the inside which plays " Somewhere over the Rainbow" I also made a matching card which you may have seen in a previous post. The last of the recent Graphic 45 releases. This one is named Voyage Beneath the Sea. I love the beautiful colours in this range I have made an easel card and added tags form the 8x8 pad and die cuts form Blue Edge Crafts Thank you for visiting my blog this week . Another new range in Graphic 45 papers . This one is named Enchanted Forest. My card is a cut off card with a tag added to the front and I have used tags from the paper pad. New Graphic 45papers have arrived. This card is made using the CityScapes range. I have used tags for the 8x8 paper pad and added Gear dies from Ultimate Crafts. Another birthday card to share with you today. I made this one for our Grandson Jamie. I have used linen card and Spellbinders scalloped ovals, EK success corners and a 3d image. Finished with Sticker Store greeting. I would also like to wish my Brother and Sister in law, Geoff and Ruth a happy 40th Anniversary today. A wonderful milestone for you both. Our theme for the Craft Mad Monthly Card Swap was to make a shaped card . I chose an SVG file from Birds Cards and cut the card on the Klik n Kut Zing. I finished the card with some rhinestones. See the other swap cards on our Pinterest page Craft Mad Crafters Thank you for visiting my page this month. Your interest is appreciated. The Craft Mad Sketch Challenge for this is live on the site today. My sample card is one you may have seen earlier on my blog. I coloured a digital image from the net ( sorry I can't identify the source) and added it to papers form my stash, added a few Quik cutz stars, Sticker Store greeting and a ribbon. I have included the sketch in this post in case you might like to try it . You can see other cards made from the monthly sketches on our Pinterest page. A happy birthday to my sister in law Therese today. Hope your day is extra special. I made this card for Therese and I hope it has arrived by now and I am not spoiling the surprise. I have made an easel card and used Prima papers, Creatables Bird cage die , Spellbinders tag die, Cheery Lynn butterfly and Sticker Store greeting.